AWS re:Invent is becoming one of the premier events in all of computing. This week we review how AWS is making AI available to everyone and I make a funny image, which of course, was devised on an airplane. Amazon re:Invent is the yearly conference where Amazon announces many new features for their cloud service. The timing of re:Invent is interesting; it’s the week after the Thanksgiving holiday. What’s better than leaving the Sunday after Thanksgiving to go to Las Vegas and play black jack, drink a lot, and bet on sports learn about AI/ML Since this event occurred over a month ago, I am not going to list all of the announcements, but rather spend time reflecting on what the event means for the future of cloud and AI/ML. Part of Amazon’s strategy in building a cannot turn down cloud platform is offering a suite of AI/ML services; services which are not just reserved for developers or people that can code, but services that everyone can use. And when I say everyone, I mean, everyone. A good example of this is a service they introduced called Amazon Forecast. This service allows users to make forecasts for products (specifically time series problems) and these forecasts are built using neural networks. Users just upload their data to AWS, and then Amazon applies sophisticated deep learning, which they claim can be up to 35% more accurate than other forecasting methods. No programming or pesky data scientist is needed, you just upload and go. You would think a service like this is expensive, but it’s quite cheap and Amazon uses a comical example to demonstrate how cheap it is. In their hypothetical pricing example, they talk about how an ice cream store – yes, an ice cream store – can use the AWS forecasting tool to produce forecasts for 2,000 stores, for a total of $11.20. If an ice cream store can benefit, before you know it, kids will be using AWS to forecast sales of their lemonade stands. Since everyone can apply AI/ML, if you store data in the cloud with Amazon and are not applying machine learning to it, you are behind. It’s that simple. 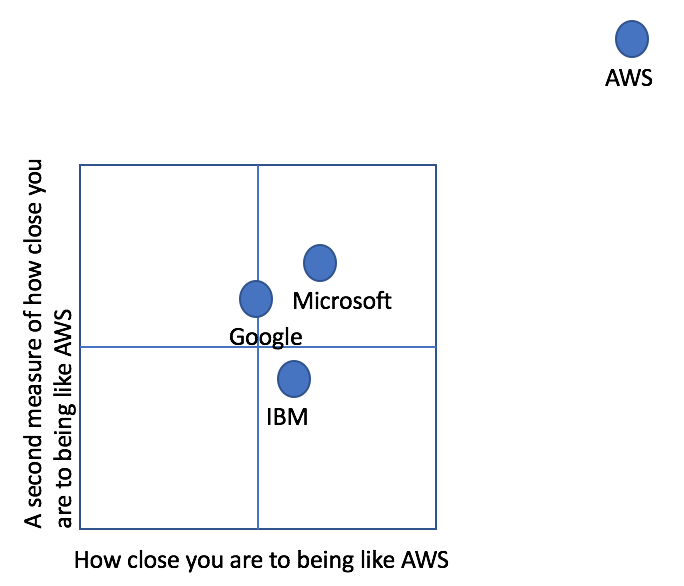 It does not matter what industry you are in, how big your company is or what level of experience in AI/ML you have, AWS is democratizing state of the art AI/ML to make this technology available to everyone. Another developing trend is the time cutting edge research is presented at conferences to when the technology is actually implemented via the cloud is shrinking. In 2016, reinforcement learning started to become popular after Google used the technique to power its AlphaGo algorithm and since then, reinforcement learning has become a popular discussion point at conferences (When I say “popular” I mean at a recent conference in Montreal, the reinforcement learning breakout session needed a room that could accommodate 3,000 people) These algorithms has a significant learning curve and often take a lot of practice to setup and use, making the technology only accessible to the highly skilled. Naturally, Amazon announced a reinforcement learning service which makes this technology accessible to developers.While it’s not as easily implemented as Forecast, it brings down the barrier significantly to being able to implement this technology. What’s also very interesting is reinforcement learning does not have many success stories, outside of revolutionizing the game of GO, most likely because it is so hard to configure. By offering a reinforcement learning service to developers, AWS has an opportunity to further push the adoption of AI all around. Another emerging trend is cloud providers creating their own hardware. While Google was the first company to announce its own machine learning specific chip, Amazon has ambitions to make all kinds of chips and announced a machine learning specific chip and a CPU. Their CPU chip, called Graviton, a result of their acquisition of Annapurna three years ago, is being marketed as a lower end chip to run basic computing needs and running an instance of this chip costs 40% less than the cheapest Intel alternative. Amazon is clearly trying to rely less on Intel, which at one point had a 98% share of datacenter CPUs, but it also seems like Amazon is trying to compete with itself, by making the cost of computation even cheaper. Since this is getting long, Amazon also announced a solution to compress machine learning models, a way to reduce high performance computing time, a way to label your training data, a marketplace for machine learning models, text analysis for healthcare, software tools to develop robot. My favorite announcement of all: you can now rent satellite ground satiations from Amazon, which means you can have data beamed from your satellite, right to their ground station and then they will upload that data to the cloud. Apparently – and this is what really gets me – customers were asking for this solution, so Amazon built it for them.